For the best in custom swag, look to the Igloo brand. Known around the world, Igloo promotional products are sure to impress your employees, clients and potential clients at company events, business expos and other industry outings. Promotion Pros offers the best in personalized Igloo promotional products, with everything from 2 gallon beverage coolers, party buckets and stainless steel coolers with your company logo. Show off your brand with customized Igloo swag to give away at corporate events, industry trade shows and to say thanks to current customers. A Igloo 10 Gallon Beverage Cooler is a must-have to serve lemonade or other beverages to guests & employees at company events. A Igloo 2 Gallon Beverage Cooler is a must-have to serve lemonade or other beverages to guests & employees at company events. A Igloo 5 Gallon Beverage Cooler is a must-have to serve lemonade or other beverages to guests & employees at company events. 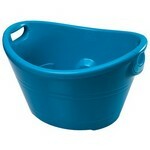 The party can last all night long with the Igloo Party Bucket to keep all your beverages cold. A Stainless Steel Igloo Cooler - Full Color Decal is ideal for company picnics or outings like hunting & fishing trips. 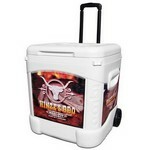 A Stainless Steel Igloo Cooler - Full Color Wrap is ideal for company picnics or outings like hunting & fishing trips. A Stainless Steel Igloo Cooler - Screen Printed is ideal for company picnics or outings like hunting & fishing trips. Ensure your beverage product is kept cool by using the Igloo Breeze 28 Roller Cooler to go to sales meetings or tastings. Ensure your company's product is kept cool for sales meetings or catering events with the Igloo Ice Cube 60 Marine Ultra Roller Cooler. Ensure your company's product is kept cool for sales meetings or catering events with the Igloo Ice Cube 60 Roller Cooler. Ensure your beverage product is kept cool by using the Igloo Majestic Blue Vtrio Roller Cooler to go to sales meetings or tastings. With a capacity of 26 cans, the Igloo The Boss Playmate Cooler is built to protect beverages or food for lunch.